"An unchanging faith, in an ever-changing world." Listen to some of your favorite hymns. All Saints Church is a loving Church family, seeking only to serve our Lord. We do this by serving our fellow man who is lost and seeking the way. We are located at 46th and Park Avenue in West Nashville. That is three blocks South of the 205 exit (46th Avenue exit) off Interstate 40. If you are seeking our Lord in your life and seeking to live your life in our Lord. Come let us seek Him together. We are not a strange new cult, but a group of mere Christians continuing in the faith and practice of the Episcopal Church as brought to this country in 1789. We have not and will not change nor be moved from being a part of the one, holy, catholic and apostolic Church of Jesus Christ. We believe the Holy Scripture to be the revealed word of God, inerrant and unchanging for all men for all times. We worship liturgically from the 1928 Book of Common Prayer. We believe the worship service should be centered on our Creator and not on a man who merely preaches his Word. We invite you to join us and see how it has ever been done by those who seek only to serve. In service to our Saviour and our fellowman. 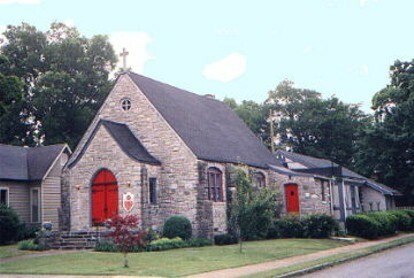 All Saints Church, the friendly Church with the red doors.